Almost three years and not a word from you, Saosin. You toured your old material to death, and we wanted something new. 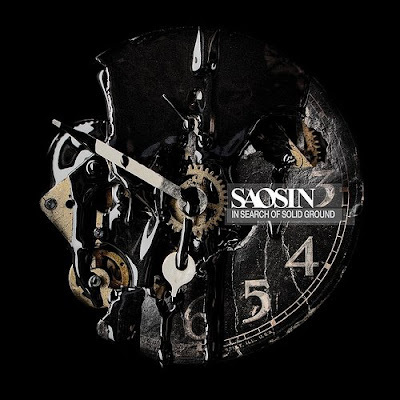 I scoured message boards for b-sides, acoustic versions, live versions and demos; I needed new Saosin. The Grey EP and Come Close didn’t remotely quench my thirst. Eventually I just gave up, concluding that I would never hear the follow-up to self-titled, your lone full-length in your six year existence. After eons of waiting, I hold the new Saosin in hand, completely shocked for a few reasons. One: it exists. Two: it’s very good. Virtually every musician’s first comment about their new release is that they didn’t want to recreate their last CD. “We wanted to try something different; we didn’t want to make [insert first album here] 2.0.” What makes In Search of Solid Ground so great is that Saosin DIDN”T stray far from what they do well. Rather than going mad scientist and wildly experimenting, the band took their sound, refined it, matured it, and put out a quality record. Songs like “I Keep My Secrets Safe,” “On My Own, and “The Worst of Me” would have been at home on self-titled, and that doesn’t bother me one bit. If “Deep Down” doesn’t hit radio waves, I’m going to throw something. It’s a killer track, and has an outrageous amount of mainstream appeal. Good luck getting the catchy chorus out of your head. The track would serve as a fantastic follow-up to “Changing,” ISOSG‘s lead single. Things stay softer and more controlled for most of the verse, which explodes into the big “changggggginggggggg” that starts the head bashing. Muy bueno. Female fans who fell in love with Saosin via “You’re Not Alone” are appeased towards the third quarter of ISOSG. “It’s All Over Now” may sound cliche, but it earns points for working in the album title before the second verse. Be warned: it’s definitely cheesy (“I can’t hear your heart beating anymorrrrrrrre”). A more fulfiling ballad is “Nothing Is What It Seems (Without You),” mainly from the guitar intro and everyone-hold-hands-and-sing-chorus. It’d be a shame if you turned the stereo off before checking out “Fireflies (Light Messengers).” The album’s 8-minute closer features some of best music on the album and is a great ending to In Search Of Solid Ground. Cove’s melodies are what make this album. While the lyrics may be a tad generic (a glance at the song titles should give that away), his stylings and mastery of melody are why these songs garner so much play on iTunes accounts everywhere. The man’s high notes are simply too cool to ignore, making him the star of the album. Old fans will like it. Newcomers will like it. Saosin has done it again, despite the odds. As a journalist, Jack's written for AbsolutePunk, MindEqualsBlown, Under The Gun Review, Substream and several other music blogs. In addition to various writing endeavors, Jack manages bands through his own company, works with InTheClouds Records and serves as a Senior Social Media Strategist at Ayzenberg Group.